I knew this day would come. The day I share the tutorial for my first icon. 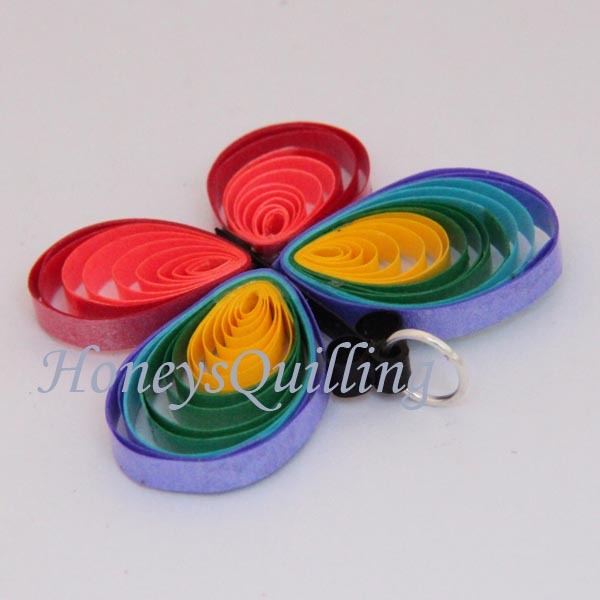 My rainbow paper quilling butterfly. I’ve had many requests over the years for this tutorial, but never got around to it. I got another request a couple weeks ago and knew I had to get it done! 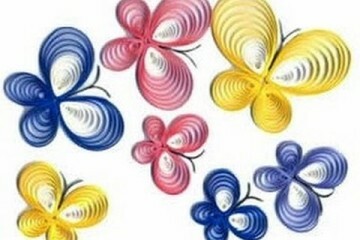 I would LOVE to give credit to whoever made these butterflies (if they are yours, let me know!). I tried searching around, but I cannot find the source. Actually if you do see these around you will most likely see them link to a youtube video. The maker of this video is NOT the original person who made these butterflies in the photo. The person making the videos is taking many quillers’ work (including mine) and making “tutorials” that try to show how to make them. So please ignore the videos from that user, they are not original and do not show the designs very well anyway. 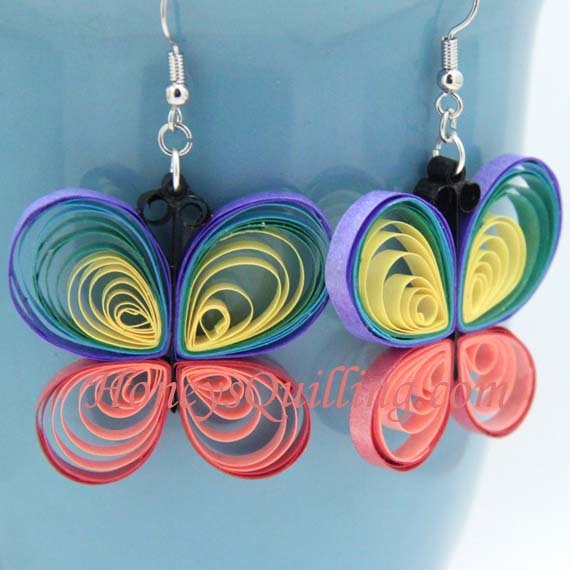 I found these butterflies years ago when I was teaching a quilling class for kids after school. I made some in different color combos. When I started thinking about what to make with the glistening papers I saw some of the butterflies I had made based on the photo above. I had an “AHA” moment and got to work! I actually made two sizes for this butterfly. This is the smaller one, and it is the one that I used for years in all of my avatars, and for the jewelry I sold, so here it is for you today! 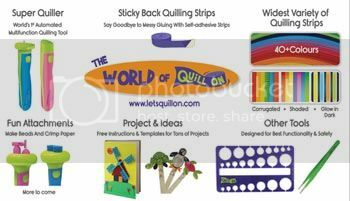 All of the papers I used for this tutorial were 1/8″ (3mm) width. You can use another width if you prefer. Normally I use PPA (perfect paper adhesive) glue, my favorite, but with glistening paper it is easier to use a thicker glue. Glistening, jeweltone, and metallic papers have a shiny surface, so it takes longer for glue to stick them together. The Aleene’s tacky glue worked more quickly than PPA to glue the scrolls closed. For the rest of the project, however, I used PPA as it wasn’t as important how long it took to dry, and I like how PPA sinks down into the strips for making the wing shape and gluing the whole design together. If tacky glue was used for the last part of gluing the design together it would leave a slightly tacky residue. The PPA dries completely non tacky. Tear or rip your papers to the correct lengths (I like to tear them as it is easier to glue torn edges together rather than smooth cut edges). Glue together a yellow, aqua, and violet strip for one wing. Repeat for the other wing. Glue together a sunset orange and red strip for the bottom wing. Repeat for the second. So you will now have 4 long strips of paper. 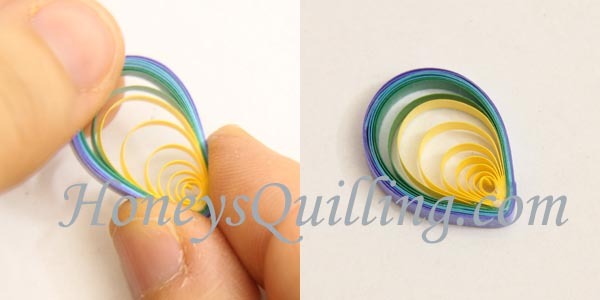 Use your slotted quilling tool (or use a needle tool if you want the tiniest center possible) to roll each long strip. Place into your circle sizing guide. 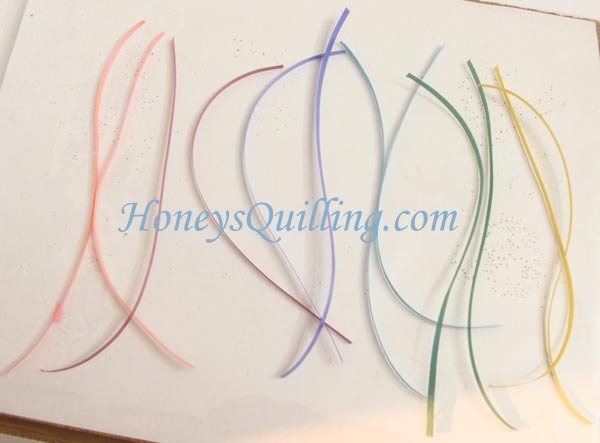 The diameter of the circle for the top larger wings (yellow aqua violet) is 3/4″ (2cm). 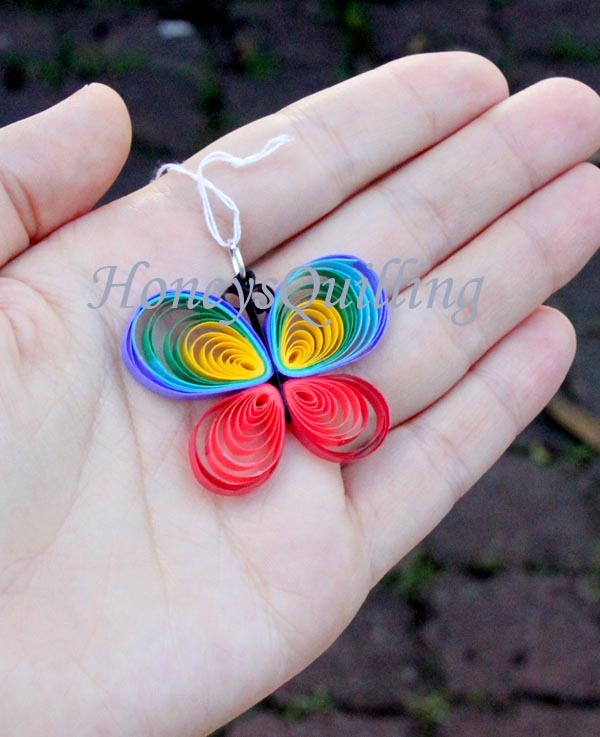 The diameter of the circle for the bottom smaller wings (orange red) is 5/8″ (1.5cm). It is okay if your circles are not *exactly* these same dimensions, but they should be close if you want it to look the same. Use a pin to draw the center of the scroll to the side and stick the pin into your board as shown in step 2 below. Then dab glue as shown. This creates the special look of the wing. 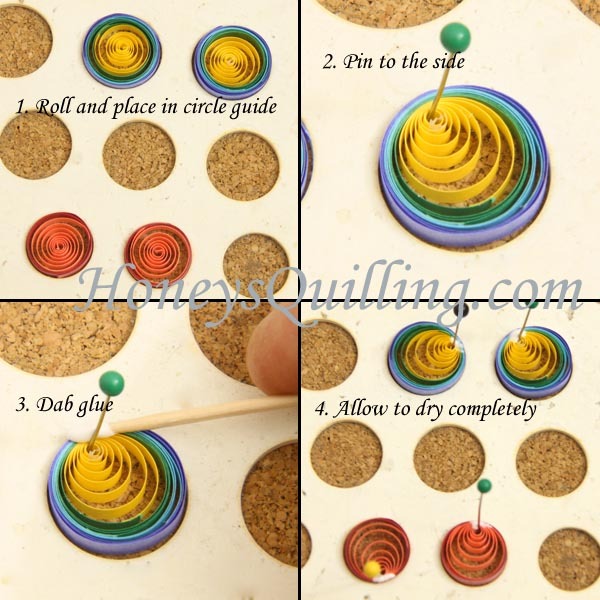 You must now wait until the glue is completely dry before taking the pin and then the scroll out of the board. 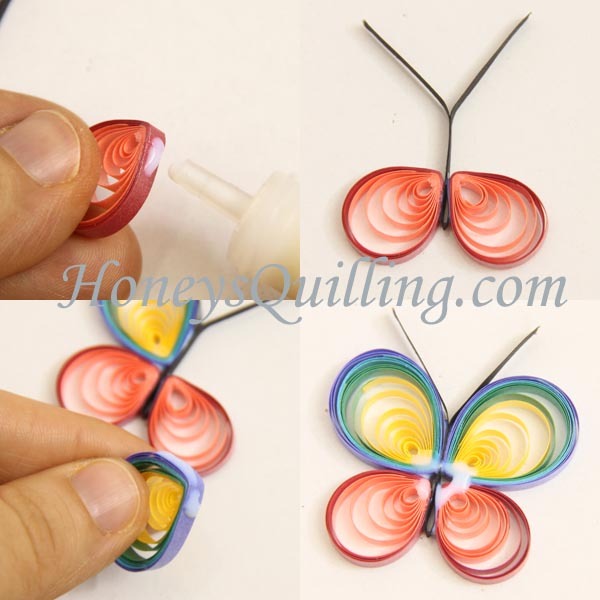 If you try shaping the wings before the glue is dry, the tight part of the scroll can come loose and your butterfly wing will not look the same. While the wings are drying, you can make the body. Fold the 3″ strip of black paper in half. Then unfold it and spread some glue along approximately 3/4″ (2cm) starting from the middle fold. Then fold it in half and spread the top parts (that have no glue) apart a bit as shown below. Once the wings are dry, it is time to shape them! Hold the more open part in one hand while pinching the tight part with the other. Do this slowly while being careful that the glued part stays glued together. If you pinch quickly it might actually break the glue and your wing will not look as nice. If this happens, just pin it to your corkboard, glue again, and wait for it to dry. 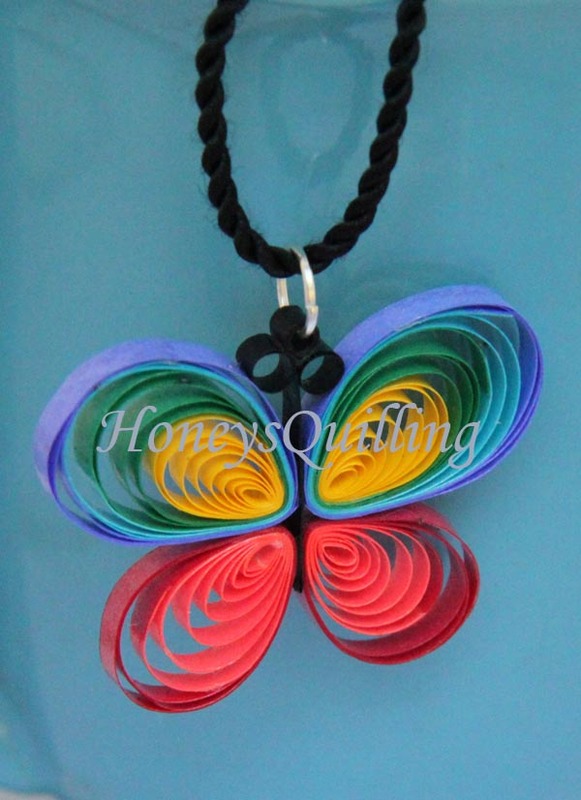 I try to get as tight of a point as I can so that the butterfly glues together more nicely. Time to glue the wings onto the body! I start with the bottom wings, dabbing some glue along one edge as shown. 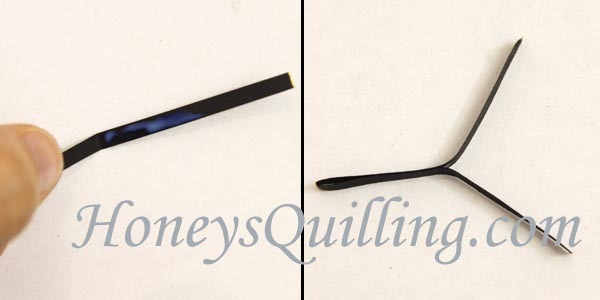 For the top wing I dab glue along both edges, so that the top wing sticks to both the body AND the bottom wing. Lastly I spread some glue around as shown in the fourth photo here to make sure everything is really glued together well. For that part I used PPA instead of Aleene’s tacky glue, as I explained in the notes at the beginning of this tutorial. At this point your butterfly could be done. You can trim the antennae and use it for any project you wish! You might, however, wish to curl the antennae, or use them for jewelry. If so, read on! 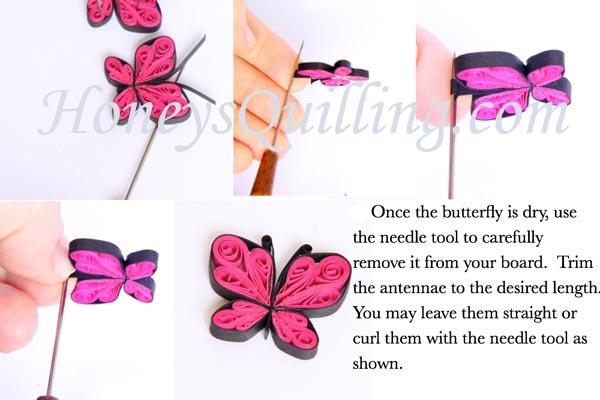 To curl the antennae, use a toothpick or needle quilling tool. 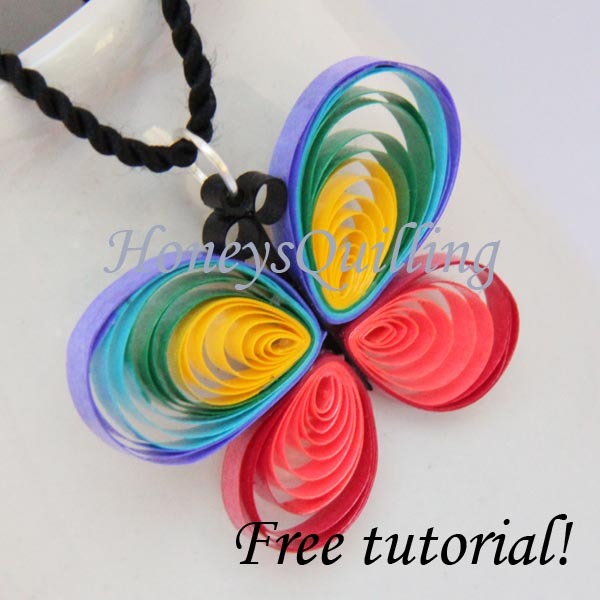 These photos are part of the tutorial for my small butterfly, but the instructions are the same and I didn’t get a chance to do the photos with the rainbow butterfly, so hopefully this will suffice! 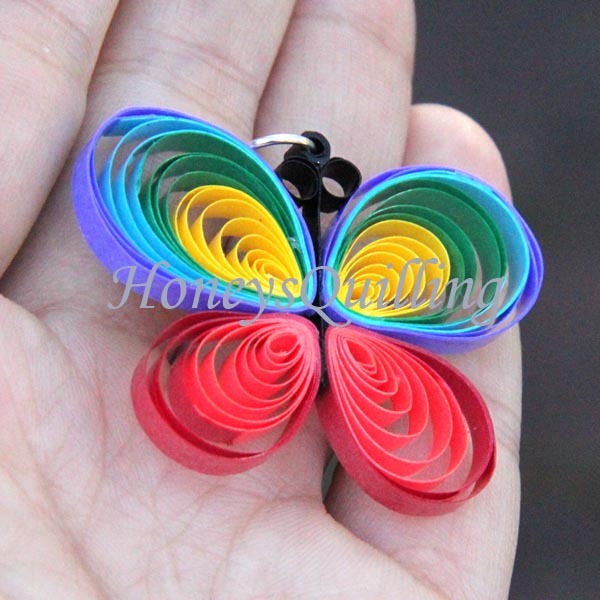 If you wish to turn your rainbow butterfly into jewelry, you’ll need to add on a small tight roll to put the jump ring through. 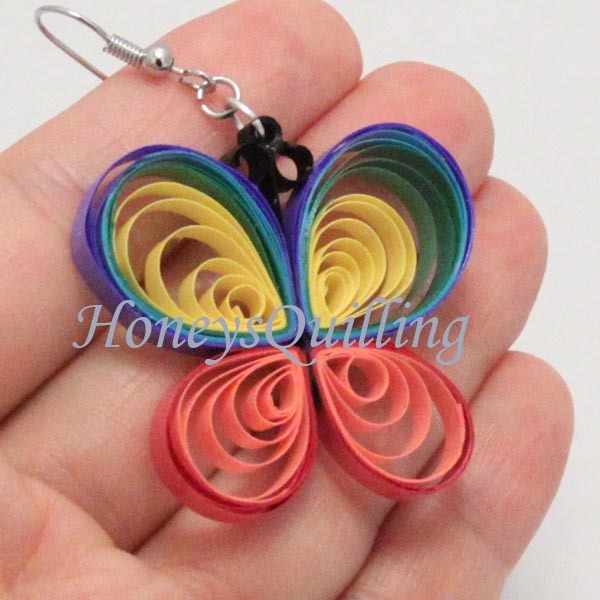 I use a 1 1/2″ strip of black and glue it between the antennae as shown with these earrings. 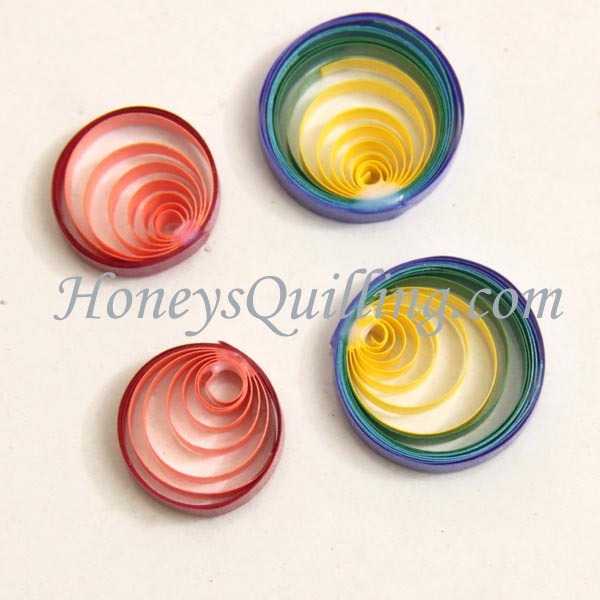 If you are using these as jewelry, you will want to use a sealant so they are water resistant and a bit more sturdy. 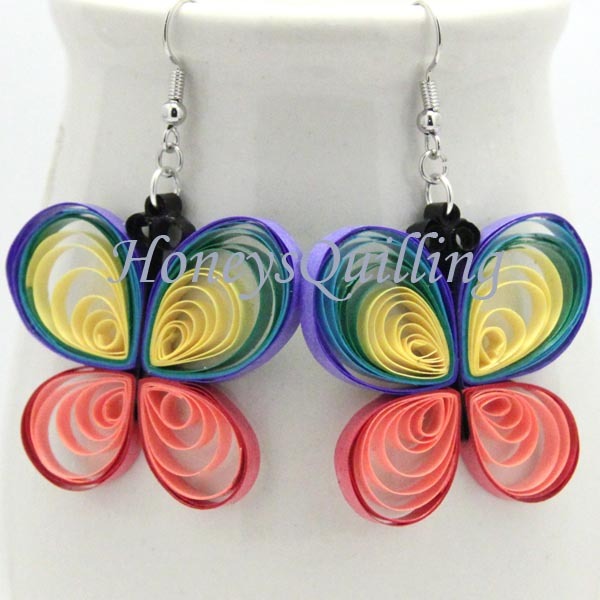 Keep in mind that these are a more delicate design, so if you use these as jewelry you will need to be quite gentle with them. Click HERE to read some posts about different sealants, how to apply it, etc. If you just want some quick instructions, just be sure to apply your sealant in thin layers, and let it dry fully between layers. Use a little brush and apply sealant to one side. Let dry. Repeat on the other side. Do this a couple times and then finally you’ll want to dab your brush in all the crevices. Do this carefully, however, as if you dab it in clumps, the layers of the wings will stick together and not look so nice. A thinner sealant will work better than a thick gloppy one for this design. If you are using diamond glaze you can add water to it to thin it down. This doesn’t work for all sealants! For PPA, for example, you can NOT add water, it totally spoils the look of it. Enjoy your butterflies! They are great for frame designs too. Here are a few more photos for your enjoyment, and then stick around the blog, there is lots to see! Thank you 🙂 I do plan on starting a video series soon, just haven’t found the time. We’re moving to a new place next month, so I’ll be sure to start once we get settled in! I am a beginner & this tutorial was very helpful. Are you supposed to wind the paper tightly then let it relax to the size needed? Thanks. ☺️ yes, you want to wind it fairly tightly first. If it looks too loose after you make the piece you can take it out if the circle guide, unwind it, and roll it again, more tightly. I love this!! 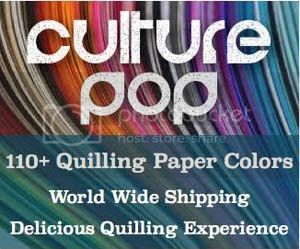 What project would you recommend for a first paper quilling project?